Do you ever feel out of step with time? My grandmother always said I was born a generation too late because I enjoyed visiting her on the farm so much. Then it took me thirty-five years to get in the spirit of the hippie back to land movement. I’m always on the lookout for books about women who’ve chosen to live in remote locations. 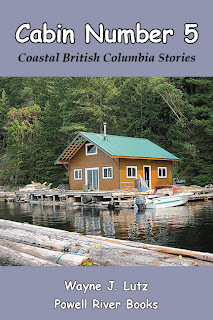 Last month on a BC Ferry ride from Horseshoe Bay to Langdale I found such a book. 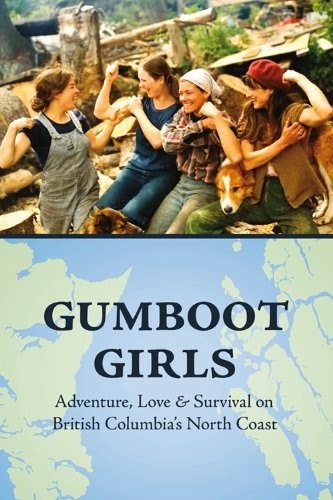 Gumboot Girls: Adventure, Love and Survival on British Columbia’s North Coast is a collection of thirty-four memoirs that was compiled by Jane Wilde and edited by Lou Allison (Caitlan Press, 2014). 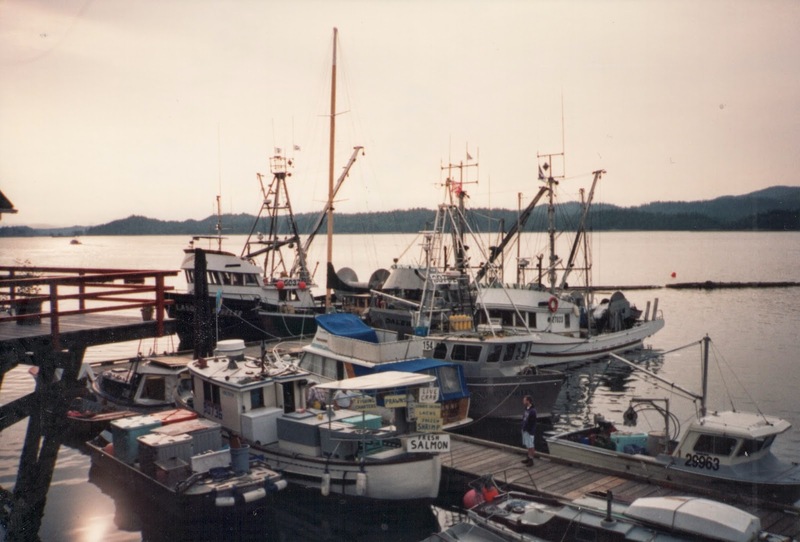 Jane was among many adventurous women who came to Coastal British Columbia in the 1960s and 1970s. This book highlights the lives of fifteen women who landed in the remote islands of Haida Gwaii (known then as the Queen Charlottes). An additional nineteen women made their homes in or near Prince Rupert on the mainland. From all across Canada, the United States, and even France they came. Many were drawn because of the desire to live a self-sufficient lifestyle away from the pressures of society, some followed men avoiding the draft and Vietnam War, some followed family and friends who had gone before them, and some came just for the experience of a lifetime. Most of the women lived in abandoned cabins, or built their own during a time when government restrictions were minimal or weren't enforced. Gardens were planted, chickens and goats raised, food canned for winter. For money, some fished side-by-side with their men, worked seasonally in canneries, or took traditional nursing or teaching jobs, but their means of getting to work was anything but traditional. 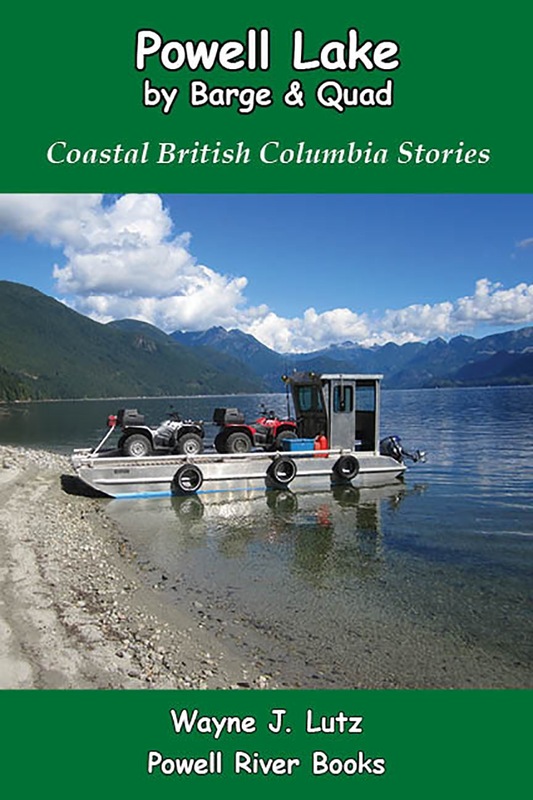 Life on the north coast required boating skills, and crossing dangerous waters in all kinds of weather. Living near like-minded people resulted in communal activities and support. It was a time of free love, living simply off the land, and few responsibilities (except for their own survival). Fresh seafood that we consider expensive delicacies were free for the taking. Some of the women stayed, but most moved on to finish their education or return to larger cities. Even so, their north coast experience shaped their futures and those years were never forgotten. When I walk around in the bush, I'm always taking pictures of things that catch my eye. Here's a moss that I thought was unusual. It looked a bit like a Tribble from the original Star Trek series. I'm not positive, but I think it's a Cushion Moss. Wayne and I went up Powell Lake to check out the logging roads at Beartooth. We'd like to ride our quads up the valley that rises up towards a snaggle-toothed peak of the same name. What we found were logging leftovers. The barge ramp was damaged and alders blocked the road up the valley. Barge ramp blocked with driftwood and alders clogging the logging road. Next to the ramp is the skid logging trucks used to dump their loads into the lake. Logs were penned nearby in booms prior to being towed down the lake to the extraction point in Block Bay. Click here to see how log trucks dump their loads. Massive skid logs are deteriorating. While the dock and bridge to shore look to be in good condition, winter storms have separated them. The bridge has sunk and the dock floats a good distance from shore. This week was beautiful, sunny and warm. Well, relatively so. Daytime highs reached 12 degrees Celsius (54 F). That's a huge difference from the deep freeze back east. 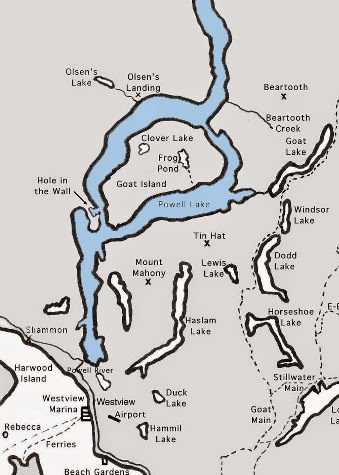 Wayne and I took a ride around Goat Island that rises from the middle of Powell Lake. Here are a few shots from our trip. Goat Island on the left and the entrance to Goat River straight ahead. Rainbow Falls across from the north side of Goat Island. Looking towards Second Narrows with Goat Island on the left. The lake was so calm there were amazing reflections all the way from our float cabin home in Hole in the Wall back to the south end of Goat. Hardly any snow! The pointed peak in the middle is Beartooth. Usually there's at least a light breeze riffling the water on Powell Lake in Coastal British Columbia, but not this day. Entrance from Powell Lake to Goat River. Combined with the brilliant blue sky it created amazing mirror reflections on the lake surface. When spring arrives, Coastal BC bursts into bloom. Many flowers are short lived, but the Foxglove can be found long into summer. Foxgloves come in white, purple, pink, and a combination. Like the Scotch Broom, they are a European garden plant that escaped into the wild, but are not considered a detrimental invasive species, even though they have proliferated in lowland areas along the coast. Foxgloves grow in open disturbed areas. Their drooping trumpet shaped flowers open from the bottom to the top of a tall straight stalk. A unique feature is that the lower flowers are female, and the upper ones are male. Pretty handy for pollination. Foxglove (Digitalis purpurea) plants are the original source for the heart medicine digitalis. 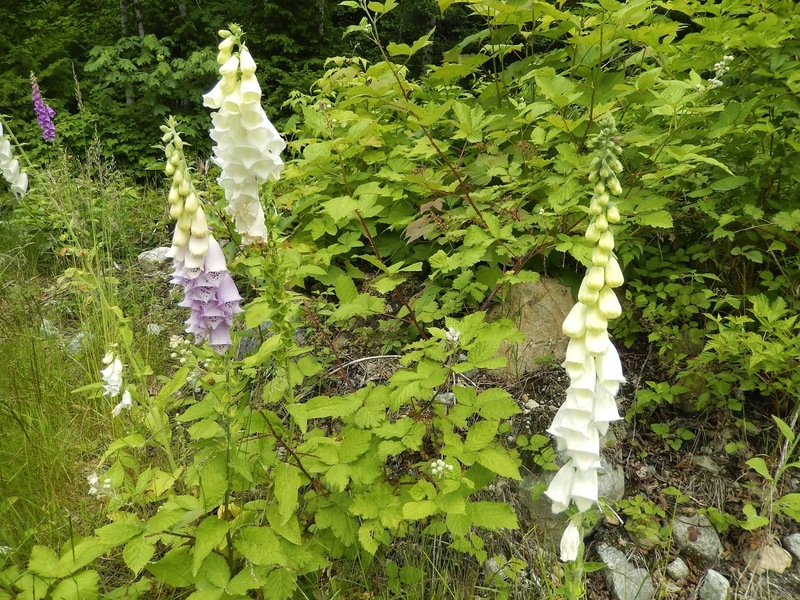 In its natural state, all parts of the Foxglove are poisonous, so beware. Wayne has a background in aircraft maintenance. He was in the California Air National Guard and was responsible for managing the maintenance of a fleet of C-130 aircraft. In that capacity, he kept extensive records for scheduled and unscheduled maintenance. 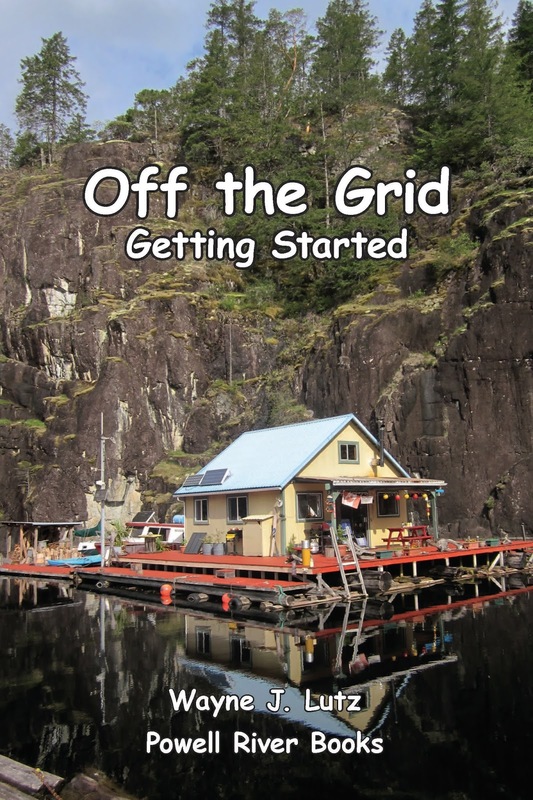 That has translated into maintenance schedules and records for all of our boats, motors, cabin batteries, generators, chainsaw; I think you get the idea. But it's a good thing, not a bad one. The records showed it was time to change the leg gear case oil in the Honda 15 motor on our tin boat. Last time John took care it while the boat was out of the water for other repairs. This time the boat was in the water up at the cabin. Not so easy, but where there's a will, there's a way. To get the motor in a vertical position to drain the leg oil, we pulled it up onto the dock where it's normally stored. We used a firewood log as a roller to reduce the friction and get father up onto the dock and higher in the air. The end result looks simple, but it took the two of us several tries to find the one that worked. Wayne put a margarine tub under the bottom of the leg and opened the hole plug to let the old oil drain out. January and February bring cloudy and foggy skies to Powell Lake. On those days, it's fun to take the quads out and try to get above the layer. 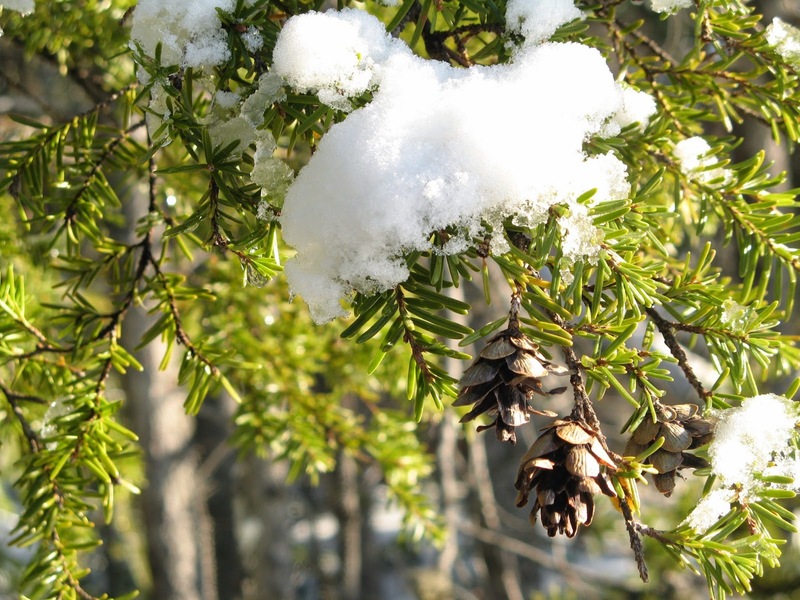 Evergreens are plants that maintain their leaves (or needles) throughout the year in all seasons. In essence, they are ever green. Evergreens come in many sizes and shapes, from shrubs to trees. Salal is an evergreen shrub that's ubiquitous in Coastal BC forests. They grow in the shade of towering evergreens, and in open areas along cliffs and log slashes. The purple berries provide food for bears, birds, and people who eat them fresh (they can be bland), in jams and wine. 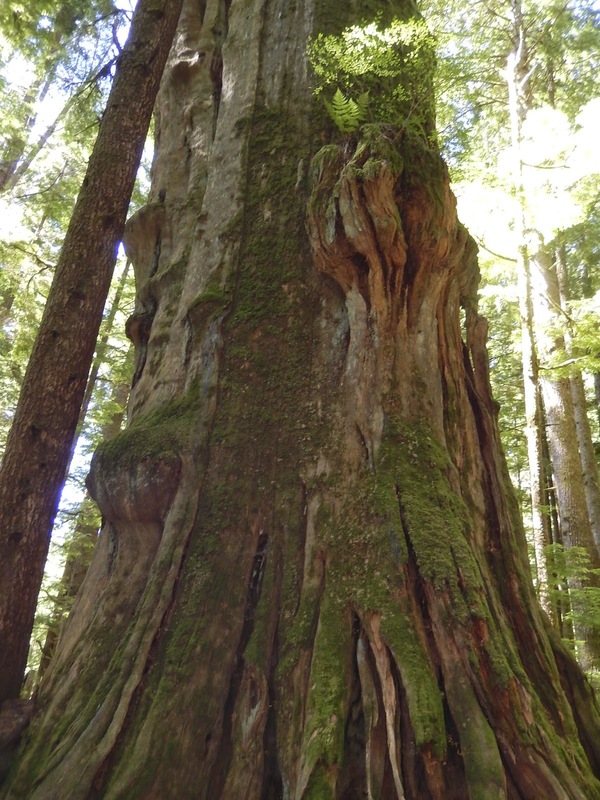 Cedar trees grow throughout the Coastal BC forests. At lower elevations the Redcedar grows in moist areas with rich soil. It was a vital resource for First Nations peoples because it was used shelters, dugout canoes, totem poles, tools, arrows, masks, paddles, and medicinal purposes. The bark became clothing, rope, and baskets. At higher elevations the Yellow Cedar grows. Cedar wood is valuable because of its quality and resistance to decay. Firs are one of the most common trees in the forests around Powell River. They grew here naturally, and are now a favourite commercial tree planted during reforestation by timber companies. The trees grow tall and straight up to 80 metres (260 feet). 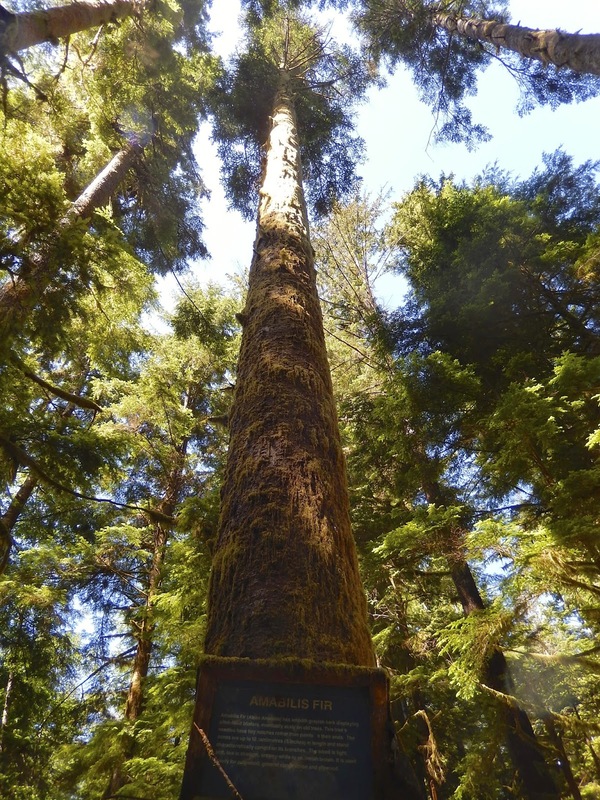 Old growth trees can achieve a girth of 3 metres (10 feet) at one hundred years. On the cliffs near our cabin the trees are approximately 100 years old, but most of the cut blocks are much younger. Pine is a less common tree in the Powell River backcountry. 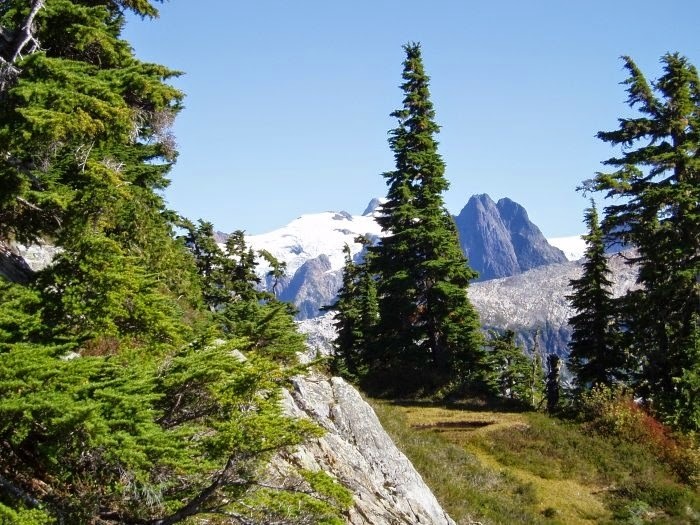 There are a variety of species in the Pine family that grow in Coastal BC. The Western White Pine is found at lower elevations on the mainland and Vancouver Island. Lodgepole Pines can be found at the higher elevations. Hemlock is another commercially harvested evergreen that grows in the Powell River area. 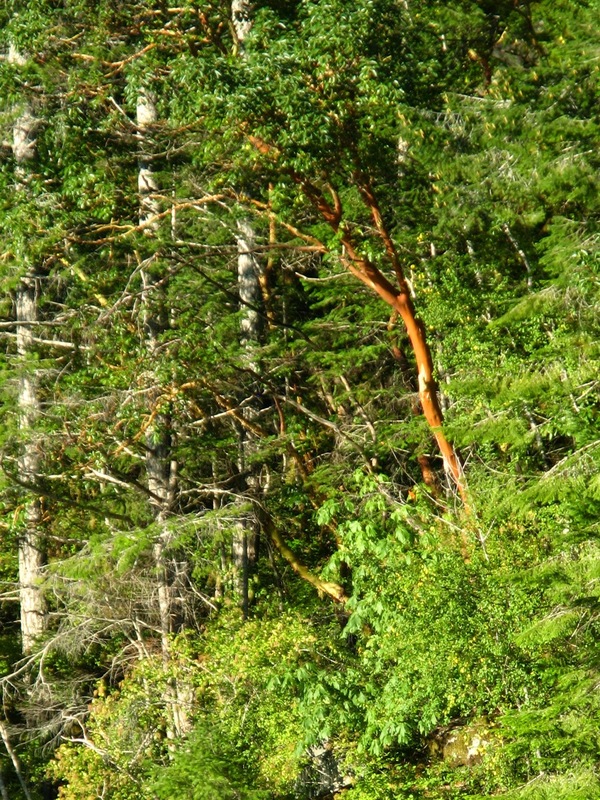 The Western Hemlock grows both naturally and is planted during reforestation. The wood grain is straight and it's commonly used today in architectural millwork. First Nations peoples carved the wood for bowls and implements. When logging is done, some things aren't worth enough to remove from the bush. Some are too massive like Steam Donkey No. 1 that I shared a few weeks ago. Some are too small or worn out. Here are a few recent examples of treasures the bush has revealed. The first three pictures are items left near Steam Donkey No. 1 up Museum Main from Chippewa Bay on Powell Lake. They came from a small cabin next to the donkey that the operator probably used to get out of the rain or snow. In the early 1900s loggers lived in camps right next to their logging shows, he might have even lived in the cabin rather than across the way where the main camp was built. There were also logging and shake block camps at the head of Powell Lake. The last of the logging camp was buried several years ago, but you can still find a shake block camp hidden in the bush along the lake shore if you know where to look and the water level is low. Rusted shackle at the Head. We found this massive shackle on our last trip to the Head. It's rusted and no longer in service, just left in the dirt next to the barge ramp. Maybe today's discard will become tomorrow's relic. The Pacific dogwood was adopted in 1956 as British Columbia's provincial flower. I think it's a great choice. The large white flowers really stand out when you get up close. The Pacific dogwood is a small deciduous broad-leaved tree that grows from California to British Columbia along the Pacific Coast at lower elevations. It can reach 20 metres (65 feet) in height. Along Powell Lake, you'll find them near the shore. In spring, the dogwood is covered with lots of large white flowers with four to seven "petals" around a greenish-white center. This makes the trees easy to find in the otherwise green forest. What looks like white petals are really called bracts. A bract is a modified leaf that surrounds a flower, usually larger and more showy than the flower itself. In the case of the dogwood, the greenish white center is the true flowering portion of the plant. "When the dogwoods are in bloom, fishing is good." Rainbow trout from Powell Lake. 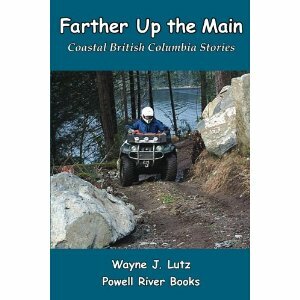 Not long ago Wayne and I were digging near our Powell Lake float cabin home and discovered a thick layer of ash. We've heard about devastating fires around the lake and figured the ash layer must be related. I did some research online and found two British Daily Colonist articles that might have been related. This daily Victoria newspaper ran from 1858 to 1920. You can browse the issues online and they are searchable, a great feature. The first article was from August 22, 1915. It mentioned a number of fires raging in the lower mainland, along the coast and on Vancouver Island including fires on Gordon Pasha Lake (now Lois Lake), Powell Lake and in Sliammon that were nearly burned out. The second article from July 9, 1918, mentions a fire sweeping up the west side of the Powell Lake through "young timber." Our cabin is on the west side up about 15 kilometres. Later it mentions fires on the east shore in mature timber were under control due to efforts of fire crews. Because this timber was more valuable, I'm sure more resources were placed there. Because there's one distinct layer, I'm guessing it's from the 1918 fire. 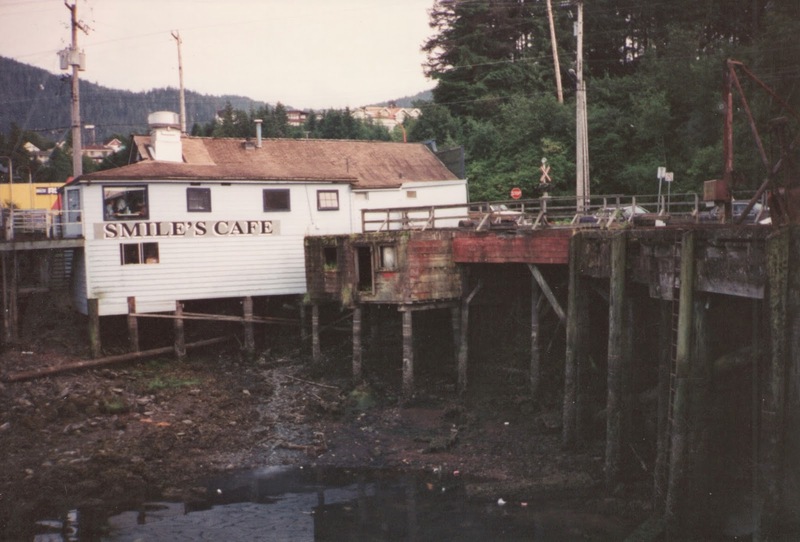 Are there any Powell River residents that might know for sure? The ash layer extends for a long distance, and we've discovered similar layers in other nearby locations. Because it's so thick and extensive I'm sure it isn't from something else man made.